Industrial door manufacturer Hörmann has provided Panattoni with a bespoke cross dock facility at its £50 million 448,000 sq ft development at Four Ashes Business Park in Wolverhampton. Hörmann provided 60 loading bays, 52 standard bay dock shelters and eight double deck dock shelters. The loading bays can increase double dock shelters on all dock doors and feature 3500mm long dock levellers with a 1000mm telescopic lip for flexibility and safety when working with various vehicle sizes. The dock levellers also allow for goods to be transported in and out of the vehicle in one single horizontal movement for improved efficiency. The double deck dock shelters have secondary electric roller blind top flaps to provide a seal on smaller vehicles using the same bay. 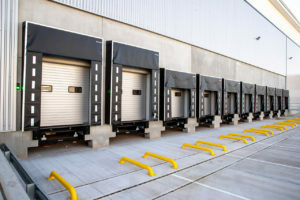 Likewise, the dock shelters provide the option to transport goods in and out of the building using larger double deck trucks, as well as standard sized heavy goods vehicles. Hörmann UK also supplied sectional insulated loading bay and level access doors offering improved thermal efficiencies throughout the site.